Wondering what it’s like to live in Heritage Communities? Rena Klerman, 80, moved into Heritage Communities’ Independent Living in 2015 – and she’s never looked back. We talked to Rena about why she chose Heritage, and what she found when she got here. Q: How did you choose Heritage? A: I had a friend who was five years older, and we were looking together. She called me and said, “Rena, I can’t stay inside an apartment all day long!” [During a tour] we saw that Heritage had little balconies outside each of the independent living apartments. That convinced us to move here. 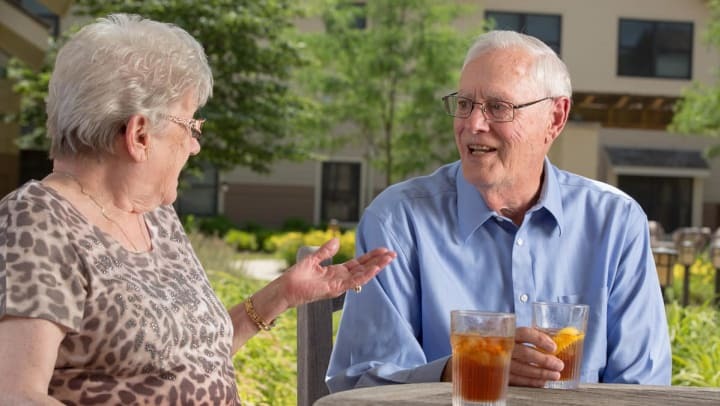 Another reason I chose this place is that if you eventually need more help, you can move into assisted living. That is a great plus, because you don’t have to move out and go somewhere new. Q: How did you decide it was time to move? A: I didn’t want to stay in my house forever. I always worried, “Who will sell the house when I’m gone?” I wanted to do it myself. I’ve seen too many people stay way too long in their house, and they can’t handle it later on. I could still take care of my house, but I didn’t want to. Q: Did you have any concerns about moving? A: Not really. I didn’t come with big expectations. It’s a little scary until you get to know some people, but I happened to find a great bunch of neighbors, and we’ve become very good friends. I loved this Heritage Communities location from the minute I moved here. Q: What’s your favorite way to spend your time? A: I’m still driving, so I do not totally rely on all the activities that are going on at Heritage. I do attend bingo and happy hour, and I go to see the singers and bands that come to Heritage to perform music. And I’m on my computer a lot. Q: What do you and your friends do for fun? A: There’s a sitting area close to the elevator on the second floor, where I live. We socialize and have get-togethers there. Someone will bring a bottle of wine, someone brings a pizza. We just have little parties! It’s always the same people, and we’re like family. We tell jokes, we sit together and share our backgrounds. It’s only been three years, but it’s like we know each other from way back. Q: What’s your apartment like? A: I have a living room and kitchen, a den with a desk and computer, a bedroom and a bathroom. I can dust it in no time! I have a blow-up mattress for when my kids come to visit. I just love it. Q: What advice would you give to someone considering a move to independent or assisted living? A: I think the most important thing is that the person makes up her own mind. If people are forced to move, they hate it from day one. If they tell themselves they won’t like it, they’re not going to like it. I believe independent living is what you make it. I only have good things to say about it. I always tell people, “What are you waiting for?” I truly believe people should move in while they’re still able to do things; you’ll have a lot more fun. Ready to start having fun? Find a Heritage Community near you.